2019 promises to be another fast-paced and exhilarating year. We all start with great intentions, but let’s face it, our busy and demanding lives quickly get in the way. As soon as stress strikes again, our new year’s resolutions go out the window, leaving us frustrated and demotivated. Does that sound familiar? You’re not the only one! Would you like to be able to…? Then this lecture is for YOU! You will learn about some of the stumbling blocks that cause havoc in our everyday lives and how to remove them. You will also find out useful tips to help you achieve your goals, stay focused and master the art of simple and joyful living. Attendance is free but registration is required due to limited seats! Register now! 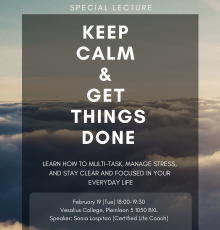 : "KEEP CALM & GET THINGS DONE"